How to Remove DRM from iTunes TV Shows? Episodes came to its season 3, which is a wonderful TV series that reflects both American and English cultures. If you are a big fan of Episodes, only watching the TV shows once may be not enough for you. Of course, you can purchase the TV shows from iTunes store, but you can only play these TV shows on Apple devices. 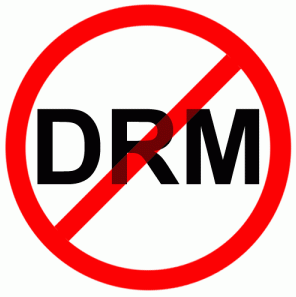 This is because videos purchased or rented videos from iTunes store are protected by Digital right management (DRM). DRM is a copyright protection technology created by Apple Inc., which means that TV shows purchased from iTunes store can only play on Apple devices. Therefore, you may encounter problems when you try to play the TV shows from iTunes store on other non-Apple portable devices and ask how to remove DRM from iTunes TV shows. Will it be very complex or difficult? The answer is negative. With AVS4Mac M4V Converter Plus, you can strip DRM from your iTunes TV shows by yourself. 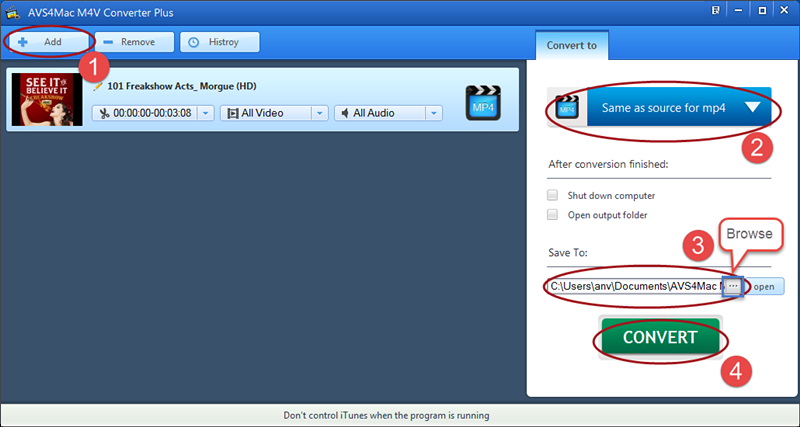 By using AVS4Mac M4V Converter Plus, you can remove DRM from your iTunes TV shows with only 4 steps. And there are many advantages of this program. First, after removing DRM, you can get the converted TV shows in the format you want with lossless quality. Second, you can choose the output format according to your needs so that you can play the converted TV shows on many non-Apple devices or share these resources with your family members and friends. Third, the program is easy to use for everybody, so you can do the job by yourself without any help. Why Can AVS4Mac Satisfy Your Needs? Here some basic information about AVS4Mac M4V Converter Plus will be introduced. AVS4Mac M4V Converter Plus is a iTunes M4V DRM Remover, so it is the best choice for you to remove DRM from the TV shows brought or rented from iTunes store. It helps you convert iTunes M4V TV shows to various formats, such as MP4, MOV, MPGE, AVI, WMV, MP3, and AAC. As a result, you can watch the TV shows on many android smart phones and tablets like Galaxy Tab/Note/S Series, HTC, Sony Xperia, and Windows 8 devices like Nokia Lumia, Surface. Step 1. Download AVS4Mac M4V Converter Plus and install it for free. Launch the program and then click "Add" button to select iTunes TV shows to the converter, or you can try to find the TV shows file and directly drag it to the program to import. After you select the TV shows you want to convert, you can click "OK". Step 2. Choose the output format on the right settings panel. You can output iTunes videos to video formats like MP4, AVI, MP3 or mobile devices like Samsung, HTC Nokia or Blackberry, etc. Tips: If you choose "same as source for mov/mp4", you can get the converted TV shows as clear as the original. You can also choose "csutomized MP4/WMV/AVI video" as output format so that you can customize parameters like video/audio codec, video/audio bitrate, etc. Step 3. Click "Browse" button to change your output path, or the output files will be saved in the default folder. Step 4. After all the settings are ready, you can click "CONVERT" button to start to convert the TV shows with AVS4Mac M4V Converter Plus. Once the conversion finishes, you can click "open" button to open the output folder and find your converted TV shows. Finally, you can transfer the converted DRM-free TV shows to your non-Apple devices through USB cable. Note: The trial version of AVS4Mac M4V Converter Plus is free, but it can just convert 1 min for each file. After purchasing the product, keycode will be sent to you to unlock the limitation, so you can get the full version. To sum up, AVS4Mac M4V Converter Plus can help you remove DRM from the TV shows you love and keep the rental videos forever. Now that this program can fulfill you needs, it is the best choice for you to strip DRM from your iTunes TV shows.